Last week saw the maiden flight of a new kind of U.S. Navy drone, a stealth aircraft that could be landing on and taking off from aircraft carriers in a few years. 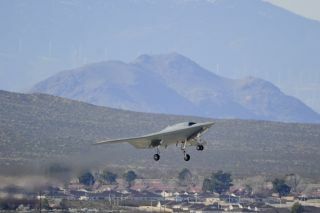 The X-47B Unmanned Combat Air System Demonstration (UCAS-D) aircraft made by Northrop Grumman completed its historic first flight out of Edwards Air Force Base, Calif., Feb. 4. The flight took off shortly after 2 p.m. PST (5 p.m. EST) and lasted 29 minutes. Taking off under hazy skies, the X-47B climbed to an altitude of 5,000 feet (1,525 meters) and flew several racetrack-type patterns before landing safely. The flight tested the system's guidance and navigation software as well as the aerodynamic control of the drone's tailless design. The event marked a critical step in the program, according to the team working on the X-47B. "First flight represents the compilation of numerous tests to validate the airworthiness of the aircraft, and the robustness and reliability of the software that allows it to operate as an autonomous system and eventually have the ability to take off and land aboard an aircraft carrier," said Capt. Jaime Engdahl, the Navy's UCAS-D program manager. Numerous tests were run prior to flight, including proof load tests, propulsion system accelerated mission tests, software maturity and reliability simulations and full system taxi tests. "Designing a tailless, fighter-sized unmanned aircraft from a clean sheet is no small feat," said Janis Pamiljans, vice president and UCAS-D program manager for Northrop Grumman's aerospace systems sector. The aircraft, which is 38 feet long (13 meters, about three-quarters the length of an F-16 Fighting Falcon) and has a 62-foot (21 meters) wingspan, will remain at Edwards Air Force Base for more flights to expand its speed and range before heading to Naval Air Station Patuxent River, Md., later this year. There the system will undergo additional testing to validate its readiness for tests in the maritime and carrier environment. The UCAS-D program is preparing the X-47B for carrier trials in 2013. Autonomous aerial refueling of the X-47B will be performed after carrier integration and at-sea trials. The Navy is hoping the unmanned craft will allow aircraft carriers to remain farther out at sea, away from land-based missile systems, while launching air strikes. The X-47B boasts stealth features, with a shape that makes it difficult to track in the sky.